Artist's rendering of the 75-foot, 149-passenger commuter boat featuring a new hull construction process. The boat will be powered by twin GM 12V71 diesels. 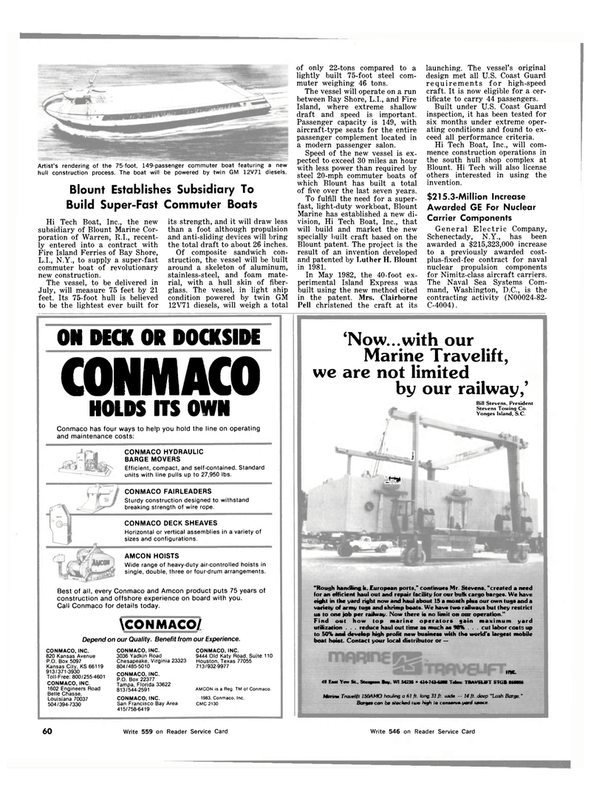 L.I., N.Y., to supply a super-fast commuter boat of revolutionary new construction. July, will measure 75 feet by 21 feet. Its 75-foot hull is believed to be the lightest ever built for its strength, and it will draw less than a foot although propulsion and anti-sliding devices will bring the total draft to about 26 inches. Of composite sandwich con- struction, the vessel will be built around a skeleton of aluminum, stainless-steel, and foam mate- rial, with a hull skin of fiber- glass. The vessel, in light ship condition powered by twin GM 12V71 diesels, will weigh a total of only 22-tons compared to a lightly built 75-foot steel com- muter weighing 46 tons. Island, where extreme shallow draft and speed is important. Passenger capacity is 149, with aircraft-type seats for the entire passenger complement located in a modern passenger salon. Speed of the new vessel is ex- pected to exceed 30 miles an hour with less power than required by steel 20-mph commuter boats of which Blount has built a total of five over the last seven years. Blount patent. The project is the result of an invention developed and patented by Luther H. Blount in 1981. Pell christened the craft at its launching. The vessel's original design met all U.S. Coast Guard requirements for high-speed craft. It is now eligible for a cer- tificate to carry 44 passengers. Built under U.S. Coast Guard inspection, it has been tested for six months under extreme oper- ating conditions and found to ex- ceed all performance criteria. Schenectady, N.Y., has been awarded a $215,323,000 increase to a previously awarded cost- plus-fixed-fee contract for naval nuclear propulsion components for Nimitz-class aircraft carriers. Efficient, compact, and self-contained. Standard units with line pulls up to 27,950 lbs. Sturdy construction designed to withstand breaking strength of wire rope. Horizontal or vertical assemblies in a variety of sizes and configurations. Wide range of heavy-duty air-controlled hoists in single, double, three or four-drum arrangements. Best of all, every Conmaco and Amcon product puts 75 years of construction and offshore experience on board with you. Depend on our Quality. Benefit from our Experience. AMCON is a Reg. TM of Conmaco. 1983. Conmaco. Inc.
Yonges Island, S.C. ] mm "Rough handling it. European ports," continues Mr. Stevens, "created a need for an efficient haul out and repair facility for otir bulk cargo barges. We have eight in the yard right now and haul about 15 a month plus our own tugs and a variety of army tugs and shrimp boats. We have two railways but they restrict us to one job per railway. Now there is no limit or our operation." Marine Travelift 150AMO hauling a 61 ft. long 31 Jt. ajide - 14 ft. deep "Lash Barge."